The little dragonfish or short dragonfish grows to a little less than 4 inches. They are also known as dragon sea moths. These fish are found in the tropical waters of the Indian Ocean, parts of the Pacific Ocean, the Red Sea and Indonesia. Doesn’t this little dragonfish drawing look like a creature from someone’s imagination rather than a living animal? Among the odd qualities of these cute little fish, they shed their entire skin in one piece. They do that to protect themselves from parasites. These are prolific little fish. Millions of them are sold each year for traditional Asian medicine. They are also sold for salt-water aquariums. However, one site listed them as being only for those with extensive experience maintaining marine animals. Another interesting aspect of these animals is that they can adapt to their environment and develop colors that mimic the colors of the sand, coral gravel or mud where they live. 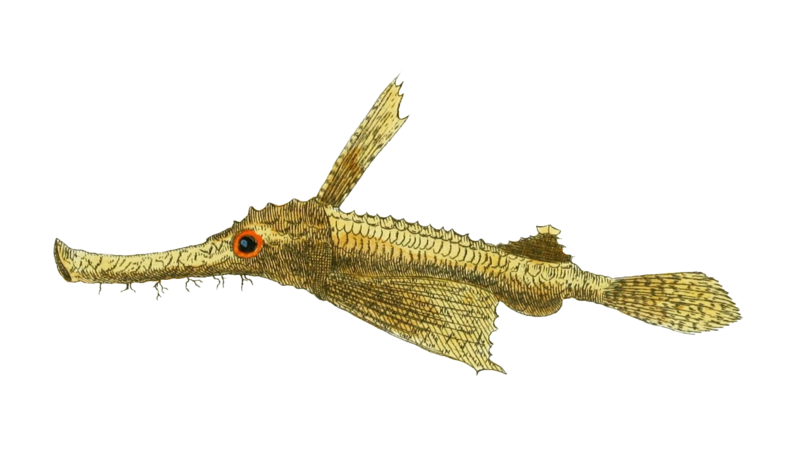 Perhaps, this little dragonfish drawing depicts a specimen who lived in an area where there was beige-colored sand or coral. Clearly this fish is long and narrow in shape. Wonderful, huge scan; the full-sized version of this vintage drawing measures 1744 x 1016px. Simply click on the vintage little dragonfish drawing below to access the full-sized version.